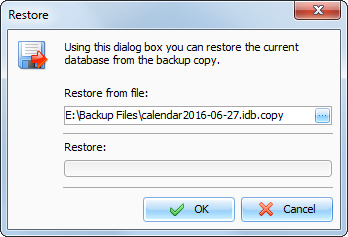 Use the Restore function to restore Interactive Calendar database from the previously created backup copy. To restore Interactive Calendar database, select the "File - Restore" main menu item. After that you will see the Restore dialog box. Specify the file name from which you want to restore the information. After that, press the "OK" button. You will see a progress indicator at the bottom of the window. When restore completed, you will receive an appropriate message.